Automatically track TV, Anime & Movies what you're watching. 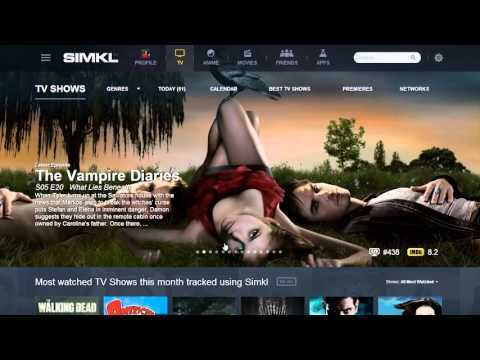 Simkl TV Tracker solves the problem of not being able to remember if that movie or show you wanted to watch is on Netflix or Amazon. Simkl was added by Ennergizer in Jul 2014 and the latest update was made in Jun 2018. The list of alternatives was updated Apr 2019 There is a history of all activites on Simkl in our Activity Log. It's possible to update the information on Simkl or report it as discontinued, duplicated or spam. Metacritic's proprietary Metascore distills the opinions of the most respected critics writing online and in print to a single number. Rotten Tomatoes and the Tomatometer™ rating is the most trusted measurement of quality entertainment. TasteDive can help you discover new music, movies, TV shows, books, authors, games, and people with shared interests. . Alternatives to Simkl for Web, Android, iPhone, iPad, Windows and more. Filter by license to discover only free or Open Source alternatives. This list contains a total of 25+ apps similar to Simkl. this is still the best site for adding and rating movies and tv shows and anime. it is not perfect. still on beta. but for what the developer has done for the site, i consider this a great site. If you are looking for an alternative to trakt ( some people are running from the new version ) and letterboxd ( paying?... bha. ) this is the best place. free imdb import, free stats! very nifty calendar and an extremely well made browser to find all the movies and show you will ever need. A lot on the site doesn't seem to be working yet. I kept getting the message 'coming soon'. Simkl will have a subscription-based model, so at least some things won't be free. Mabye some of the stuff that is free right now will no longer be so when the software heads out of Alpha and Beta phases. Their (cancelled) Kickstarter campaign, for example, included a $99 tier that included 5 years VIP subscription, which the description said would otherwise be a lot more expensive. That being said, I'm having the same problem as wallpaperflower. For instance, I tried downloading the Alpha scrobbler, but only get a blank page. you are totally wrong. I spoke with the creator and he said anything users use now is free forever. Thank you for the additional information – although, could you provide a link to a source for that? And, just to be pedantic, that doesn't make me "totally wrong", it doesn't even make me slightly wrong ;) I mentioned that (a) there will be a paid subscription, which still seems to be the plan, and (b) that it might be required for some features that are free right now. I haven't seen any source indicating that, and didn't claim so; just that it's theoretically possible. @Anamon Hi, I am a developer at Simkl. And let me address some of your concerns. It's been 3 years since your "it will be paid" comments, and during that time Simkl was the only site among alternatives that did not have a paid option. It was ALWAYS FREE and had ZERO ads for logged in users all these years. We're building Simkl with the community in mind, and we always listen to what our members want and are making the site and apps around community requests. Feel free to add and vote for your ideas on how we can improve Simkl at http://support.simkl.com/forums/264009-top-ideas-from-the-community and join our community Discord server https://discord.gg/u89XfYn . We plan to have an additional paid option for supporters only to be able to build new features that require more budget. All the features and apps that are currently available on Simkl will always be free. I've only been using SIMKL for 4 months now, I believe, and the VIP options, from what Andrew himself has pointed out during my inquiry, will be extra features besides the current general operation of the website. As for the actual present features, they are too many to count, and many more being added frequently, for example in there few months we got countdown timers, new review improvements, comment/memo changes (from requests), optimizations of the chrome tracker, and the Android/iOS apps, which also got some new features added to them (new sources to check detailed descriptions, such as AniDB). Andrew and Ishika, the developers of the website and apps are always active on Discord and they solve any issues or wishes that the users whom join the server ask of them. There are channels for reporting bugs and these also get solved in less than 12h. In other words, I don't know how it was back in 2015, but now, in 2018, SIMKL and the team behind it provide the best tracker for all my entertainment. Just to clarify again, with my post in 2015 I didn't intend to criticise Simkl for planning a paid subscription, nor to imply that features will be taken away from the free tier. I was only pointing out that a paid tier had been announced, but no details about what would be paid and what would be free (at least not that I could find back then). The intention was to tell potential new users to keep that in mind before they lock themselves into a particular service, by spending a lot of effort filling it with their data. Our main goal is to give the freedom to use your data where ever possible without locking you into one service. You can Export your data by downloading a backup here https://simkl.com/apps/import/csv/?e or by accessing the API https://api.simkl.com . You can also import your data from 9 different services to Simkl at https://simkl.com/apps/import/ .